Thank You to everyone who helped with the first round of voting on book titles for the four-volume set on Standard Operating Procedures. Post this in forums, chat rooms, and all the places where technical folks hang out. Thank you for your feedback!!! 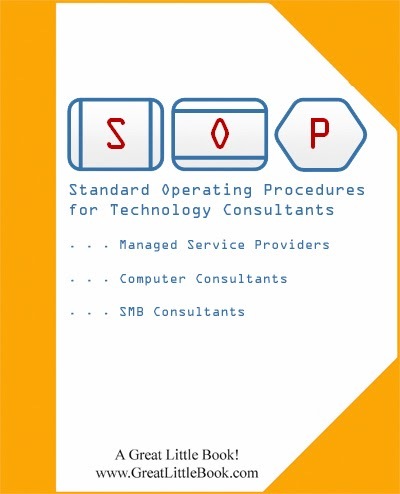 We all know that SOPs - Standard Operating Procedures - make your business run better. We all know that we need to train out employees to document procedures, learn procedures, and follow procedures. But all too often, the bosses and owners don't follow the rules we set for our companies. When we start a new business, we have to do everything ourselves. There aren't many procedures. Procedures evolve over time. And even then, we shortcut the procedures whenever we're in a hurry. It's a natural evolution. Once employees come along, three important things change for the business owner. First, "I" becomes "We." Second, the owner becomes a team leader. Third, the owner spends a good deal of time getting in the way of her employees. But when you start hiring employees, "I" not longer does all the work: We do the work. Eventually, the owner hands off some tasks and knows that he'll never do them again. At first, you have to consciously try to remember to use the Royal We. But this becomes easier over time. Part of the process of being "We" is that you get in the habit of describing your company and your services in those terms. For example, "We like to get full backup before we start a server migration." That's not just one person's good habit. That's what the company does and that's what the client can expect. Many of your best practices can be projected to the clients in this manner. The owner becomes a team leader automatically with the first employee. But once you have solid SOPs in place, it's the owner's constant responsibility to build up the SOPs as part of the company brand. This is the way we do things. This is what makes us different. This is what makes us who we are. If team leader isn't blunt enough for you, let me put it another way: The owner becomes the enforcer. Assuming you have good processes, the more consistently you enforce your processes, the stronger your brand becomes. When everyone does whatever they want, you don't really have a business. You have a bunch of people working together to try to make money. And that's fine. But if you want a business, you need to have consistently reproducible results. To make that happen the owner must become the enforcer of SOPs. The first real job I had was in a hardware store. I remember both the owner and the store manager used to tell me: "When you have your own store you can do whatever you want. When you work here, you do things our way." And so it is in your business. Eventually, the business is mature enough to have several employees and several SOPs that are employed consistently. One of the very natural pieces of evolution is that the owner becomes the choke point. Marketing decisions have to be approved by the owner. Office supply purchases have to be approved by the owner. Time cards have to be approved by the owner. The owner has started to delegate but is still the ultimate decision maker for all important decisions. Only when you break past this barrier can you business move to the next level. Either you stagnate, or break the limit. It could go either way. With luck, you learn the next level of delegation and learn to delegate authority and not just tasks. When you delegate authority there's no limit to how large your business can grow. At this point it is very clear why the owner (and now the managers) must obey the SOPs of the organization. That means that you use the ticketing system just as you expect your technicians to do. That means you follow the process for turning in mileage reports, just like everyone else. That means you follow the rules just like everyone else. When you have a mature operation that runs smoothly, you can really muck things up when you exclude yourself from the rules. First, you can actually make a mess. For example, if you just grab the phone and start answering client questions, you've short-circuited the service delivery process. The service manager and service coordinator don't know what you're up to and you don't know about the other problems or the context of the issue you're working on. Whether they tell you or not, they're mumbling that you should stay out of the service department. Second, this can lead to bad moral within your company. Watching the boss is a favorite past time. When the boss doesn't follow the rules, everyone notices. Employees will mumble, "Notice that we have to track time in real time but he doesn't." (and many similar complaint) And they will be justified to notice this. You are building these SOPs for good reasons. Please follow them. Take them as seriously as you want your employees to take them. And more importantly, just get in the habit of doing this as your company evolves. That will make it easier. It is a very natural tendency to say "I own this place, I'm the boss, and I can do whatever I want." But that attitude will cost your company money and keep you from reaching its greatest potential. The third annual online event is a business focused conference for I.T. professionals, with 12 amazing experts - including Michael Gerber. , a goal at the heart of this year’s conference. Gerber has been called “The World’s #1 Small Business Guru” by INC. Magazine. He has spent over 40 years targeting a niche in the small business market. He addresses through books and speaking tours the specific issues small business owners with technical skills encounter, a lack of direction on the small business skills required to run highly successful businesses. The online conference runs June 24-26, 2014. Registrations are being accepted now. Attendees can choose to listen live or obtain access to the recorded sessions. In all, the conference will broadcast fifteen hours of programming over the three days. To learn more about Systematic Success 2014, visit www.smbonlineconference.com. I have a couple of updates for you on the 4-volume series about Standard Operating Procedures. Think about what you'd put into Google or Amazon if you were looking for something like this. What would you search for? Second - I have a Table of Contents. Well, a draft table of contents anyway. You can find that at http://sop4smb.com. I've also put this table of contents on the SOPFriday.com site so that you can see articles related to the sections of the book. Of course some pieces of the book have not been covered on the blog. When you scroll down the page there, you'll also see the blog posts in the order they were published. I think that "resource" will go away soon. After all, searching by topic makes more sense. And of course you can just hit CTRL-F to find a term on the page. The bottom line is . . . I'm making progress on the 4-book set. If you have feedback on the table of contents - or if I missed something really important - please email me and I promised I'll read your feedback. One of the great benefits - and curses - of the 21st century is the "Auto-Payment" for goods and services. We use them to pay for all kinds of things. And we ask our clients to do the same. The great advantage of auto-payments, of course, is that you don't forget a payment. And some services are only available with credit card or other auto-payment. The great disadvantage of auto-payments is that you can lose track of the total amount. And the real major pain-in-the-neck disadvantage comes when your credit card expires. Or in these days of credit theft, we're seeing banks suspend credit cards for almost any suspicious activity. That's great for protecting your credit - unless it leads to missed payments for one or more auto-payments! 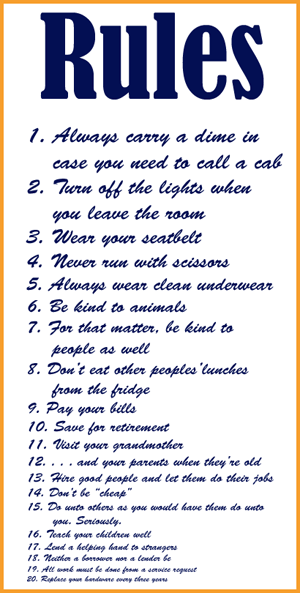 Here are a few tips to make your life easier. The first thing you need to do is to create a spreadsheet of auto-payments for your business. See the example. It's also a good idea to track cards that are stored with online sites that allow you to make occasional payments. This is less important since you can change these on a whim. But if someone in your company makes payments for you, you need to make sure the correct card is stored online. 1) Dig out bank statements and credit card statements for the last four months. 2) Open Excel and create a new spreadsheet with columns for the day of the month, the name of the service, the amount, and the credit/debit card used. 3) Look through your statements and mark each item that is a recurring payment. 4) Enter the recurring payments on your Excel spreadsheet. Enter the day of week on the appropriate column. Then look ahead for the same payment for the next month, and the next, and the next. Because of weekends, some payments will move around a bit. On the spreadsheet, keep the date that occurs the earliest for each item. This will come in handy some day if you want to use this information to assist in tracking your cash flow. 5) Keep an eye out for payments that recur once every two or three months. There will be fewer of these, so you need to be careful not to miss one. Of course there might also be one or two that recur once every six or twelve months. It's probably not worth looking through a year's worth of statements to find them all. See #6. 6) Make it a habit to verify auto-payments as they occur. That way, you can add the once-per-year and twice-per-year items to your tracking sheet. 7) Note that some items vary from month to month. Be sure to note these. If you enter the highest occurrence over the four month period, you'll have a safe budget. 8) Total the entries at the bottom. It never hurts to know what you've committed yourself to every month! As I alluded to above, there are certain hassles with relying on credit cards for auto-payments. The same is true with debit cards (ATM cards). You need to decide whether you'll use credit cards, debit cards, direct ACH payments, or a combination of these. (ACH stands for Automated Clearing House - a system that enables you to make payments directly from your bank account.) You are most likely using a combination of these. Credit cards are a good choice if you don't want to keep track of whether or not you have enough cash in the account at a given time. Debit cards are a good choice if you want to work on a "cash" basis. When a debit card is charged, the money goes straight out of your account. ACH is a good choice if you like to work on a cash basis like a debit card but don't want to worry about expiration dates. 1) The biggest hassle you have to deal with is the expiration date for each card. If you don't keep on top of this, you'll have a spate of rejected payments. You can avoid this by moving to ACH payments, which don't have an expiration date. You can also avoid this by changing the card online as soon as you receive a new card. 2) The other big hassle you'll have is when a card you're using is canceled or suspended due to suspicious activity. I've been a victim of this myself. Two summers ago, the card I carry when I travel was canceled twice within a month. My travel isn't unusual at all for me, but the bank wanted to protect me. In addition to being a hassle on the road, I had to go put a number of payments onto a new card before the next charge hit. This is becoming more and more common as banks get more and more skittish about fraud. If you want to use a credit or debit card and avoid having it canceled due to travel or other activities, you should get a card you only use for online recurring payments. This could be a credit card with just enough of a credit line to cover the recurring payments. Or it could be a debit card that is never used for anything else. That's what I use. Once you have a spreadsheet, it should be maintained by whoever manages your finances regularly. That might be you, the office manager, the bookkeeper, etc. Make sure new recurring payments are added to the list and old ones are removed. 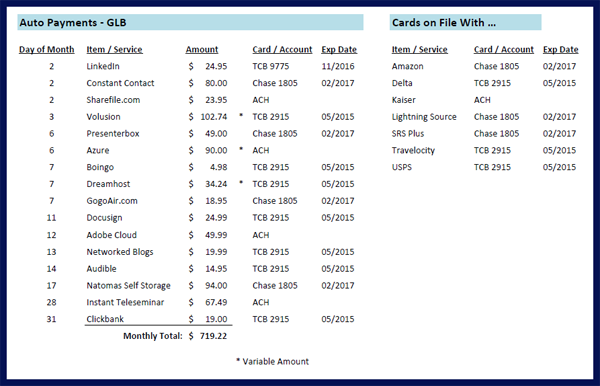 The true benefit of keeping this tracking sheet will come when you change cards, change banks, or need to take a look at your budget for planning purposes. So, of course, whenever you make such changes, you need to make sure to update the Excel spreadsheet. I recommend you keep the spreadsheet in your public folder under the \operations\finance folder. Help! What Should I Call My Book on SOPs? 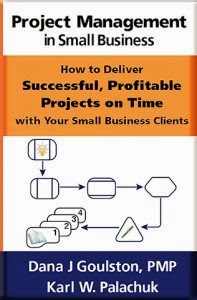 As most readers of this blog know, I'm writing a series of four books on Standard Operating Procedures for Small Technology Consultants. 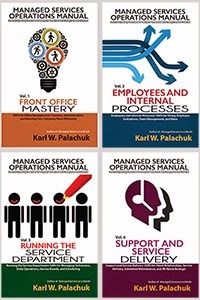 I'm writing a series of four books on Standard Operating Procedures for managed service providers. 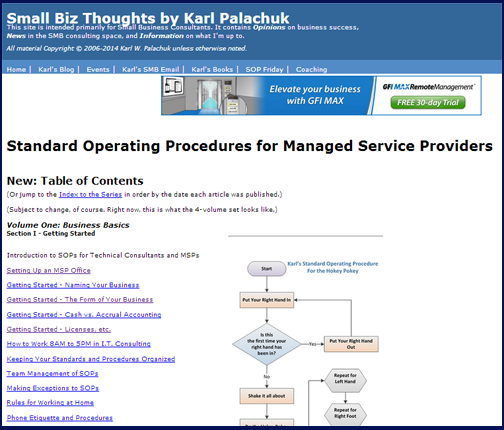 I'm writing an operations manual for managed service providers. I'm writing a series of four books on Standard Operating Procedures for I.T. Consultants. I'm writing a series of four books on Standard Operating Procedures for computer consultants. Please help me figure out what to call this 4-book series. Don't worry about SEO and all that. SEO will take care of itself. Between the contents and the sub-title, I can cover all the bases. There are two primary considerations here, as far as I am concerned. 1) I want a title that actually sounds good. It shouldn't be awkward. For whatever reason, the titles I've come up with don't slide off the tongue. Managed Services in a Month is nice and smooth. Service Agreements for SMB Consultants is very clear. I want something nice like that. 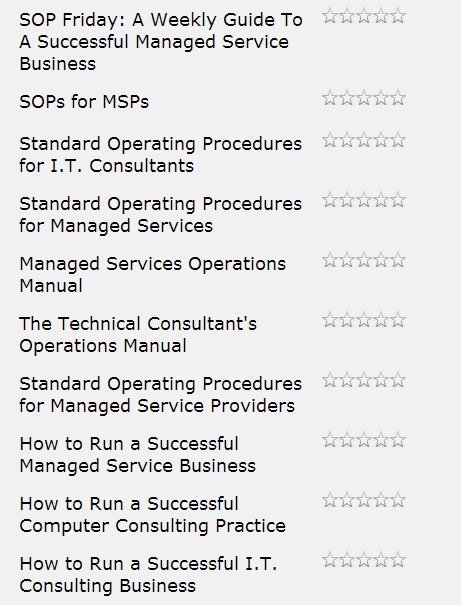 2) I want to appeal to all those people who could really use these books and have never heard of the term "managed services." I know that seems odd if you've been reading my blog for years, but I think MOST people who could - and should - be managed service providers have never heard that term. So what do they call themselves? VARs? LARs? IT Pros? Computer consultants? That's where you come in. Please take 60 seconds and give me some feedback. It's okay if you rate these suggestions high or low, as long as it's honest. If you have other recommendations, please enter them on the form or in the comments below. At least temporarily, the site for these books is called www.sop4smb.com. But if you were searching for such a book, what would you call it? And what would you call yourself? No name or other information required! If you fill in contact info, we'll make sure to keep you informed as things develop.